General Site Configuration/Shape: Rectangular; The New Albany Company owns the site as well as surrounding expansion ground. The site can be sized to fit the needs of the end user. Topography of the Site: The site is generally flat with a minimal slope. Additional Acreage Available: As the master developer for the business park, The New Albany Company has the ability to increase the size of the site to fit the customer’s end use. Soil Conditions: Topsoil cover underlain by natural clay based soils containing random sand and/or gravel layers and lenses. Clay based soils suitable for conventional construction and a burying capacity of 3,000 psf. Existing Structures and Status: 8 residential structures and outbuildings located on the site are owned by The New Albany Company will be removed at no cost to user. Identify Current Property Owners: The New Albany Company (NACO) owns the proposed site as well as the expansion ground surrounding the site. NACO was founded by New Albany residents, Les and Abigail Wexner, in the 1980s. Mr. Wexner is the founder, chairman and CEO of L Brands, the parent company to Bath & Body Works, Victoria’s Secret and other national retail operations. 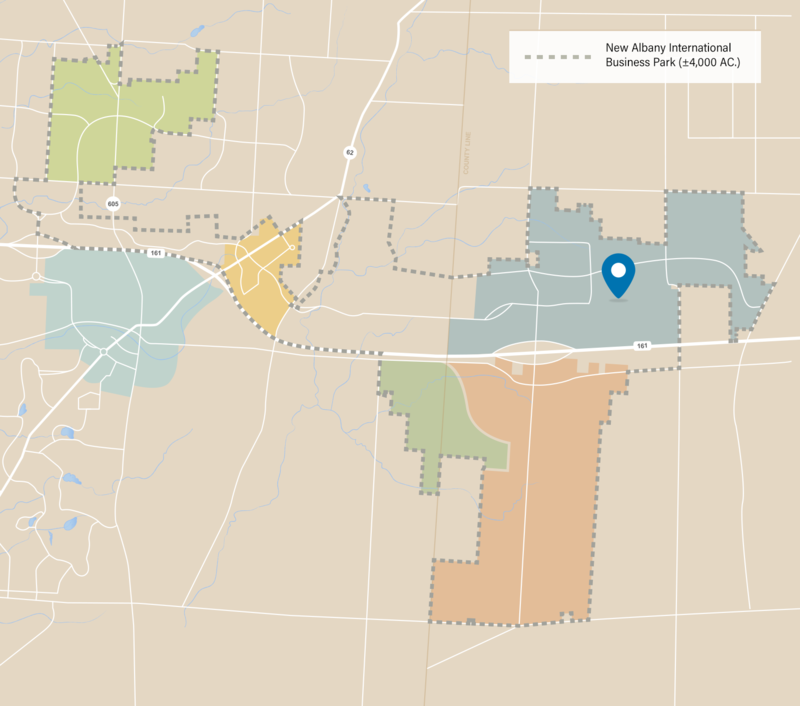 NACO’s master planned community encompasses over 10,000 acres, of which over 3,500 acres make up the New Albany International Business Park. Current Zoning: The site includes parcels that have been incorporated into the city and zoned Limited General Employment (L-GE). The zoning allows for Class A office, information technology, production & clean manufacturing, research & production. Height Limit: The current height limitation per the zoning text is 65 feet. Use Restrictions: There are no restrictions at or near the site. The property is a part of a 10,000 acre master-planned development specifically designed for production, manufacturing and distribution facilities. The Business Park is divided into several economic clusters to maximize the utility of each site and to encourage business growth and development: research & technology, medical, corporate office and manufacturing. Surrounding Land Uses: Advanced manufacturing; logistics; corporate HQ; research and technology, agriculture. Future Land Use Plans for Site: Extension of the existing Business Park to include corporate office, research, technology, mission critical facilities, manufacturing, logistics and supporting retail and service uses. CC&Rs in Place for the Site: Property will be subject to the Covenants, Conditions, Restrictions and Easements for either the New Albany Business Park or the New Albany Business Park East (CCR’s). The CCR’s provide for certain design review procedures and landscaping and fencing requirements along public road frontages within the Business Park. Security fencing, guardhouses and similar security features are permitted and have been constructed in the Business Park as part of other enterprise data and technology centers developed in the Business Park. A copy of the CCR’s will be provided upon request. Rights Not Held by Property Owner (i.e. mineral rights, water rights etc. ): The property owner holds all rights to the property. Road Access to the Site: The primary access to the site is Innovation Campus Way – a collector road that connects to Beech Road and the SR 161/Beech Interchange to the west and Mink Road and the SR 161/Mink Interchange to the east. Both Beech and Mink Roads are major arterials. The Mink Road interchange will be constructed by the Ohio DOT and will be completed in late 2017. Service currently available at the site: Service is currently available at the site. Voltage of nearest transmission line(s): An AEP 138 kV transmission line with two circuits is located along the north border of the site. Jug Street Station is located 0.5 miles north of the site and is served by both 138kV and 345kV lines. The Corridor station and Kirk stations are located 6 miles north and 12 miles south of the Jug Street station, respectively. Name of substation serving property and distance: Jug Street Station (.5 miles) – Currently has 1 – 50 MVA transformer with approximately 20 MVA of load. Jug Street Station was built with the capacity to have a total of 4-50 MVA transformers. Corridor Station (5 miles) – Currently has 1-50 MVA transformer with approximately 37 MVA of load. AEP does have the capability of adding 2-50 MVA transformers. Blendon Station (8 miles) – Currently has 2 – 50 MVA transformers with approximately 52 MVA of load. Future planned capacity/infrastructure expansions: American Electric Power is currently constructing Project Vassell which will create an additional 765 kV transmission tie to the 345 kV – 138 kV networks. Availability of customer choice: Ohio is a competitive state for electric generation. Customers have the opportunity to shop their energy (generation) requirements with a number of Competitive Retail Electric Suppliers (CRES). Service currently available at the site: Service is approximately 1,000 feet from the site. Future planned capacity/infrastructure expansions: Columbia Gas has the ability to expand service/capacity to meet user’s needs. Future planned capacity/infrastructure expansions: Internal booster pump may be necessary for eastern most sites adjacent to Mink Road. City of New Albany evaluation installation of booster pump on main line to increase & maintain water pressure throughout development area. Identify any planned upgrades to the water system, including the schedule and the source of funding source for the project. Currently undergoing a $70M upgrade to install ozone and biologically active filtration. In the next 5 years upgrades for the following will occur: Standby Power, UV Disinfection and conversion from chlorine to bleach. Size of nearest line(s) & Distance to the property (feet) An existing 18″ sanitary sewer mainline is located on the north side of Innovation Campus Way, generally along the frontage of the subject site. Description of telecommunications infrastructure The 96 strand fiber network is built for high speed data communications and to reach customers economically throughout the New Albany Business Park. Additional redundancy/path options are available. Fiber available at the property? If yes, aerial or underground? Yes. All of the infrastructure in New Albany is underground. Diverse options are available as well. Wetlands Delineation: Completed; 401/404 Permit Issued. Isolated wetlands have been filled. Individual permit will include wooded wetland and stream conservation easement over +/-21 acres within site. Endangered Species: Completed; Potential protected bat habitat limits tree clearing to 10/1 to 3/31 of each year. Site has been mostly cleared.